Receive an occasional burst of sunshine and a little flower, recipes, craft projects and FREE resources. Ratatouille in a pie! And it was delicious! They tasted very homemade and comforting. The good thing about ratatouille is that you can use any vegetables that are in season and it actually tastes better the next day. So you can make it ahead of time. 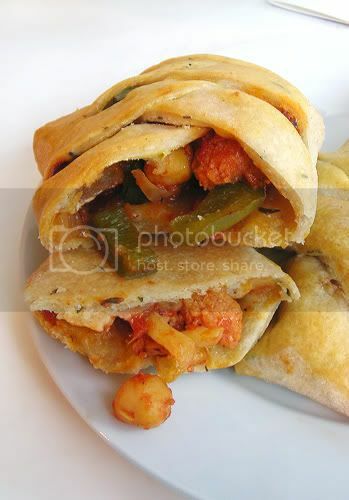 I actually used what I had on hand, cauliflower, green peppers and I added some chickpeas. Maybe you’re not going to serve this for Christmas but I think it can make a good brunch, no special occasion needed. For this braided Christmas Tree Pie, I was inspired by one of the Daring Bakers Challenge where the participants had to do a Danish Braid. I don’t participate in Daring Bakers (yet! ), but I remembered being really impressed by some of the participants work and especially Marika’s braid (from Madcap Cupcake). I had bookmark this to try one day. Instead of puff pastry though, I just used the same pastry dough from the 3am Curry Pies. 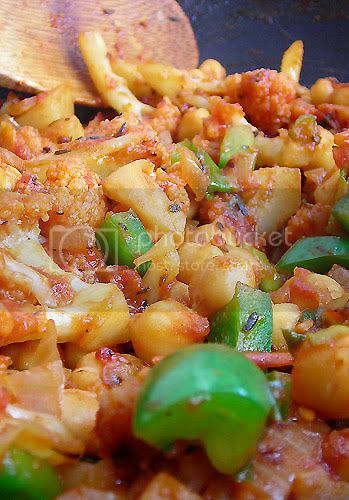 Add 1 tablespoon vegetable oil in a deep fry pan or wok. Add onions and garlic. Stir and let fry for a few minutes. Add cauliflower. Stir and cook until starting to brown lightly but not mushy. Add tomatoes and chickpeas. Stir and mix well. Cook uncovered (adding water occasionally as required) until cauliflower is almost tender (but again not mushy). Sprinkle the dried thyme in. Lastly stir in the peppers and mix well. Remove immediately from the heat. Allow to cool completely before filling in. Using the pastry dough from here, divide in 5. Roll each one out on a floured board and brush with some oil. Sprinkle with some dried thyme. 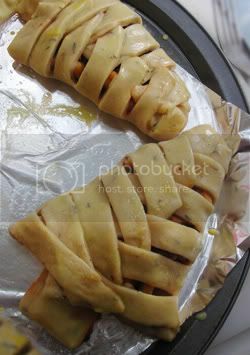 Fold in 3 lengthwise and again in 3 across the width to make a square. Roll out again into a square approximately 15 x 15 cm (6 x 6 inches). 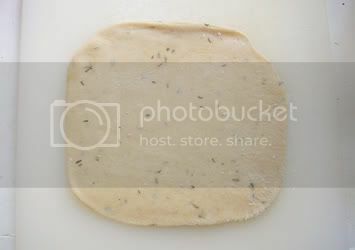 Fold 2 opposite sides towards the centre to create a rough mark on the dough. 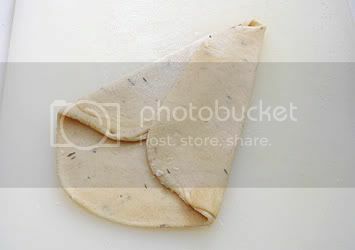 Fold sides back. Make cuts (about 1cm wide) perpendicular to the mark. Cut the bottom like in the picture to form the tree trunk. 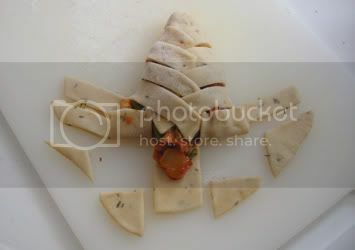 Place some filling in the middle on the dough; don’t put too much filling on the stem part. Begin closing by folding over the strips and alternating from the top. Fold over the bottom to close and form the trunk. (Press on either side to enclose). Place on a greased baking tray. Brush with soymilk (I added a pinch of turmeric in the soymilk to obtain a nice golden colour). Bake for 30 – 40 minutes until pastry is a nice golden colour. Becks from I am not a rabbit! - Her trees were so cool! Those are, truly, a work of art! And I bet they didn't taste half bad, either! ;) YUM! That is genius! And beautiful! I totally love it! Why has it taken me so long to find your awesome blog??? Another genius creation! Looks delicious AND festive - my two favorite things! What a great idea, and such a beautiful presentation, too! Wow - very clever and very cute! impressive! and thanks for the step by step instruction! I love it. How pretty! What a creative idea. It looks wonderful and I bet it tastes even better. Yum! 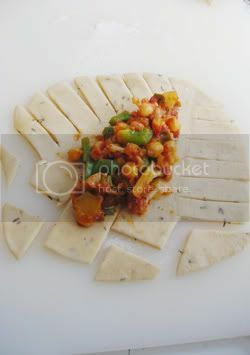 Mmm I love ratatouille! And your trees are adorable! It is crazy how talented you are. Wow! Lauren, I think there's a long way for me to go before I can reach Martha Stewart's level! DJ, thanks for commenting about the blog layout. But then sometimes I wish blogger would provide more customizable ones though. And thanks to all of you for all the nice comments! OMG!! 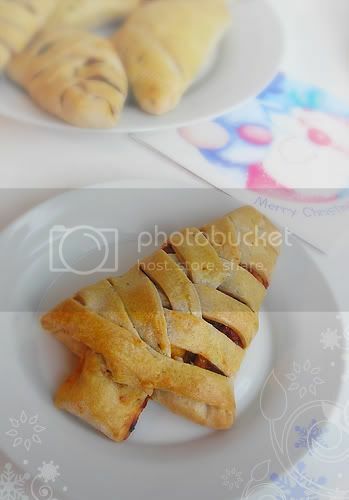 I am SO adding these Christmas tree pies to my list of awesome vegan Christmas goodies! Wow, they are beautiful! 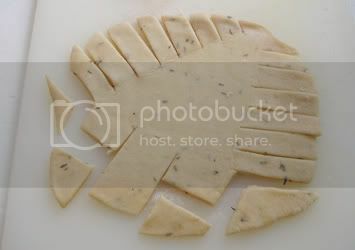 Those are, without a doubt, the cutest savory pies I have ever seen! i just made these- AMAZING. my dad even stole half of my grandma's. "Just living is not enough," said the butterfly. "One must have sunshine, freedom, and a little flower." Follow Veganlovlie's board Anything Vegan Dishes on Pinterest. Blog, photos, recipes, text contents by Teenuja Dahari is licensed under a Creative Commons Attribution-NonCommercial-NoDerivs 3.0 Unported License. Based on content at www.veganlovlie.com. 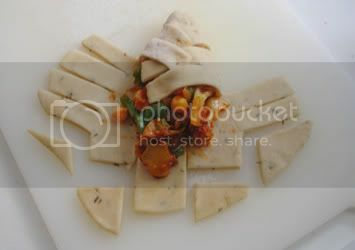 All recipes, photos and text are © Teenuja Dahari, except where mentioned otherwise. Powered by Blogger.